JNN 19 Feb 2014 Manama : Forces of Al Khalifa regime on Friday raided the Imam Sadeq (AS) Mosque in Manama. Sheikh Meisam Salman, an official with Bahrain Human Rights Watch Organization condemned the attack on the biggest mosque of Shias in Bahrain, describing it as a sign of sectarian hatred among the country’s rulers, Al-Alam news network reported. He called on the world community to push for an end to organized attacks in Bahrain on mosques that belong to the followers of Ahl-ul-Bayt (AS). Sheikh Salman also urged international organizations to apply pressure on the regime to stop its attacks on religious places. He said the Imam Sadeq (AS) Mosque has a high status among Bahraini Shias and every Friday thousands convene in the mosque for Friday prayers. Attacking this place of worship with tear gas and desecrating its sanctity is a stark violation of the rights of Bahraini Shias, he underlined. 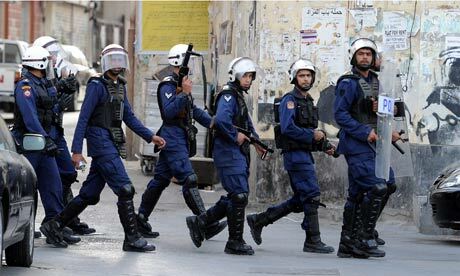 Bahrain has been the scene of almost daily protests against the Al Khalifa regime since February 2011, when thousands of pro-democracy protesters took to the streets, calling for the royal family to leave power. This entry was posted in Middle East and tagged Al Khalifa, Al Khalifa forces, Bahrain, Bahrain Human Rights Watch Organization, bahraini Forces, Imam Sadeq, Manama, Meisam Salman, Mosque, Raid, Shia Mosque. Bookmark the permalink.